Enjoy responsive dry handling thanks to Dunlop Touch Technology. A flatter tread profile puts more rubber in contact with the road, resulting in improved grip and steering precision. A tight link is maintained between rim and tyre, giving you a tactile feel for the driving surface. With enhanced road feedback, driving becomes more enjoyable. Experience confident driving in wet weather. The SP StreetResponse benefits from an asymmetric tread design to increase grip on wet roads. Grooves in the tread evacuate water rapidly, reducing the risk of aquaplaning in heavy rain. The special tread compound lowers rolling resistance to give you greater fuel efficiency, without compromising wet grip. Asymmetric tread design provides improved handling and aquaplaning resistance. The continuous center rib increases stability and precision. The asymmetric groove arrangement enhances grip on wet and dry surfaces. Benefits: Improved performance on straight lines and around corners; increased resistance to aquaplaning. The new generation of Dunlop tyres features a flatter tread profile with a 4-8% bigger contact patch, depending on size and type of tyre. A bigger contact patch delivers more stability and enhanced road feedback, allowing tyres to respond quickly and precisely. Benefits: Increased stability and steering precision; reduced heel and toe wear; excellent cornering stability and precision; superior dry grip. MRT designs employ ten different radii and are therefore more precise. This results in highly effective pressure deployment on the road contact patch. The effect is smoother transitions from straight to corner, leading to more precise and progressive reactions. Benefits: Significantly better control over the evolution of the footprint in all driving conditions; responsive wet and dry handling; increased cornering control. 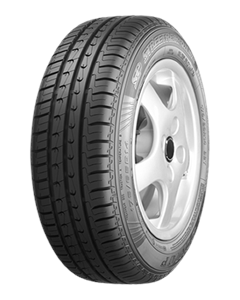 Strengthens the link between tyre and rim for a more precise driving experience. Like the grip between your hand and the steering wheel, the Specific Bead Seat System enhances control and conveys outstanding road feedback. Benefits: Enhanced road feedback; greater stability and precision. Asymmetric tread design delivers high levels of aquaplaning resistance. The massive outer shoulder block ensures rapid and turbulence free water drainage, while also ensuring outstanding cornering stability. Benefits: High aquaplaning resistance; increased road contact; enhanced cornering stability and steering precision. A rim flange protection system. MFS employs a profile of rubber that runs around the circumference of the tyre above the wheel flange. This creates a protective buffer zone. Benefits: Protects expensive alloy wheels from kerbing. A Hybrid Overlay Technology that reduces circumferential deformations at high speeds. Benefits: Superior high speed stability; smooth and even wear.